Juan Ramón Alvarado (‘99, Costa Rica) celebrated three remarkable achievements in 2012: winning Costa Rica’s “Cup of Excellence” competition, selling his coffee for a record-high price in the country’s most important international coffee auction, and achieving the second-highest sales record in Latin America. Only time will tell what other accomplishments this EARTH graduate will achieve in the future. Now, he reflects, “Agriculture is a passion, I carry it in my blood.” Indeed, the business has grown out of a family tradition. His great-grandfather began producing coffee on the farm in 1890, working with a cooperative since that time. The farm, which is comprised of 35 blocks of land in the San Isidro de Heredia area, is called Brumas del Zurquí (“Mists of Mount Zurquí”) because of its proximity to Braulio Carrillo Hill, commonly known as the Zurquí. Upon graduating from EARTH, he worked for eight months for a coffee importer in Germany, and then for three months in Mexico. When he was in Mexico, his father grew very ill, and Juan Ramón returned to Costa Rica and began working in the livestock sector. In 2000, coffee prices fell internationally, and Juan Ramón’s father’s illness prevented him from caring for the farm. For the farm to thrive in the future, they would need Juan Ramón and his sister Natalia’s help. The siblings decided to create a micro-beneficio (coffee-processing center) where they could process the coffee themselves. In this way, they could add special value to the product and seek an alternative niche market­. At the time they began, theirs was only the second micro-beneficio in the country; now there are more than 150 in Costa Rica. The company began by building a strong global business network over the course of 10 years. The farm, beneficio and surrounding area have enchanted many international clients; some have even spent Christmas there. The first year’s crop was given to the Coffee Institute of Costa Rica (ICAFE) to be sent to Italy. In 2002, Juan Ramón and Natalia began sending it to Asia. As of now, Japan is Brumas del Zurquí’s main client–with 11 Japanese clients. Indeed, Juan Ramón takes pride in the his and Natalia’s collaborative hiring decisions and commitment to fair hiring practices for a workforce of about 15 families on the farm. All of the employees’ children study in primary or secondary school and at the National Training Institute (INA). Juan Ramón has also dedicated himself to making the relationship between buyer and seller more transparent – and to helping other Central American growers do the same. 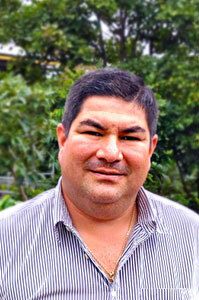 Four years ago, he worked with other “boutique” coffee growers to create Exclusive Coffees. The company helps 75 Central American growers to position their coffees within the global marketplace by guaranteeing quality control for both producer and buyer. It offers growers packaging that standardizes minimum cup size, a tasting room for buyers to try the coffees, and a platform through which both parties can form partnerships. At the same time as Juan Ramón diversifies his business network, the farm’s activities have grown. He keeps approximately 40 livestock animals on the farm, where the company “treats them with love.” The animals eat a mixture of some of the fresh coffee chaff, roasted coffee husks, leftover water from the beneficio’s honey-roasting process and animal feed concentrate. The rest of waste from the coffee-processing is diverted into organic composted fertilizers for the coffee plant nursery and to irrigate the animal pastures.